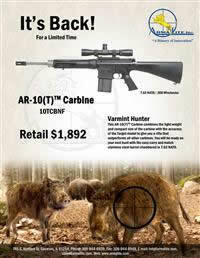 ArmaLite announces that for a limited time it is offering the AR-10 1913 Carbine in small numbers. 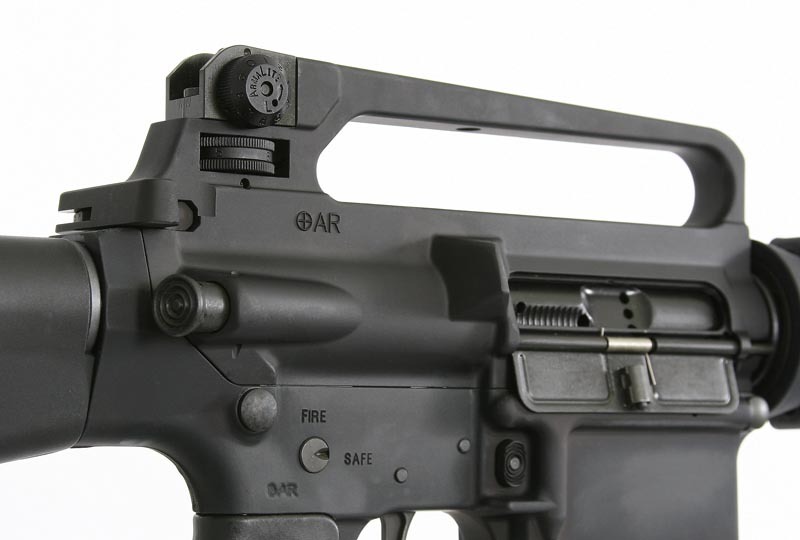 The AR-10 1913 Carbine comes standard with a National Match two-stage trigger. It features a 1913 quad rail handguard, forward assist and collapsible stock. Compact yet rugged, this AR-10 is perfect for both tactical and sporting uses. This limited run of AR-10 1913 Carbines has just come through the line and IS in stock. Contact your local ArmaLite dealer for details on continued availability. Armalite.com. Source: Soldier Systems – According to Janes Defence Weekly, the British Army is adopting a new a semi-automatic 7.62 mm x 51 mm ’sharpshooter’ rifle offered by Law Enforcement International (LEI) and manufactured in the US by Lewis Machine & Tool (LMT). The Stoner-style L129A1 features LMT’s Monolithic Rail Platform (MRP) technology with a one piece upper receiver and Mil-Std 1913 railed fore end. The L129A1 fires from a 20 round magazine. Additionally, it incorporates a retractable stock and 16” black stainless barrel. One of the key features of the MRP is the ability to rapidly change out barrels rather than the entire upper receiver. For some reason, many punters on various internet forums have misconstrued this feature to imply that the barrels would have to be changed in the field every 100 rounds. This information is incorrect. The design was selected over the H&K 417 and FN’s SCAR, both currently in service with Special Operations Forces as well as a weapon proposed by Sabre Defence. The $2.5 Million deal will supply 440 of the new weapons starting early this year in order to satisfy an Urgent Operational Requirement for troops fighting in Afghanistan. Currently, the only organic weapon for UK forces capable of reliable engagement beyond 500 meters is the L7A1 7.62 mm General-Purpose Machine Gun. The L129A1 will replace the aging bolt action Accuracy International L96 in the Sharpshooter role. In the British Army certain troops are provided with specialist training and designated as Sharpshooters. They do not fulfill the role of Snipers but rather provide enhanced lethality and accuracy to the small unit leader. The GL-Shocks unique patented design allows it to be mounted on any standard MIL-SPEC or commercial carbine receiver extension (buffer tube). It is a drop-in replacement for the standard M4-style stock. The GL-Shock auto-adjusts to fit both commercial and MIL-SPEC buffer tubes with a tight, rattle-free fit. 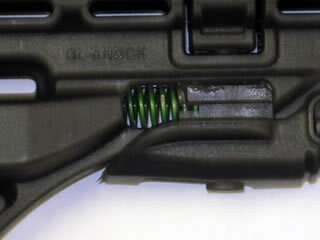 Unlike other recoil management systems for AR-15 carbines, the GL-Shock does not use expensive non-standard buffers or buffer springs which often affect the function of the weapon. With the GL-Shock, all factory buffer parts are retained, since recoil-reduction takes place in the stock itself. 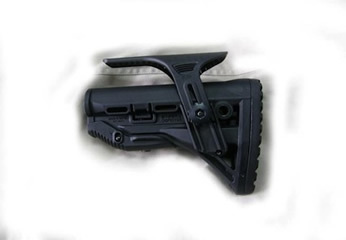 The GL-Shocks design is based on The Mako Groups very successful GLR16 buttstock, a high-end M4/AR-15 stock with a two-battery storage compartment and a rubber buttpad. 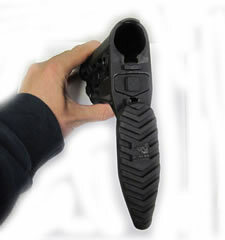 The tire tread-inspired, integrated rubber buttpad grips body armor or tactical vests, improving weapon control. 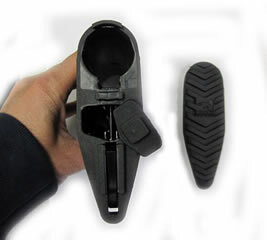 The GL-Shock features slots for three sling attachment locations, as well as quick-detach sling swivel mounts on both the left and right sides of the stock. Pushing a button allows the GL-Shocks rubber buttpad to slide down, exposing a gasket-sealed waterproof battery compartment. The GL-Shocks enlarged storage compartment fits a wider array of batteries and spare parts, such as extra firing pins, gas rings, springs, or extractors. ArmaLite, www.ar10t.com, www.GunBroker.com, and www.GunsAmerica.com Team Up In A Fundraiser For NSSF. (Geneseo, IL) ArmaLite, Inc. is pleased to announce that it is one of the partners in an extraordinary effort to benefit the National Shooting Sports Foundation. This partnership is in honor of NSSF’s 50th anniversary in 2011. At the request of www.ar10t.com, ArmaLite has donated two AR-10(T) rifles chambered in .338 Federal. Both rifles include a beautiful laser etching of NSSF’s 50th Anniversary logo on their mag wells. NSSF has granted www.ar10t.com special permission to have the rifles etched with the NSSF logo and to be the official host of the auction. The rifles will be auctioned; one on www.GunsAmerica.com, the other on www.GunBroker.com; from November 5 through November 19, 2010. A portion of the proceeds will go to NSSF. The National Shooting Sports Foundation is the trade association for the firearms industry. Its mission is to promote, protect and preserve hunting and the shooting sports. Formed in 1961, NSSF has a membership of more than 5,500 manufacturers, distributors, firearms retailers, shooting ranges, sportsmen’s organizations and publishers. For more information, log on to www.nssf.org. GunBroker.com is an informative, detailed, secure and safe way to buy and sell firearms and hunting/shooting accessories. 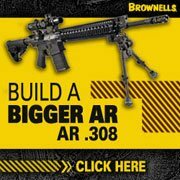 GunBroker.com promotes responsible gun ownership. 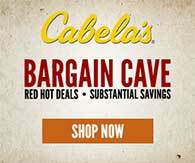 Aside from merchandise bearing its logo, GunBroker.com sells none of the items listed on its Web site. Third-party sellers list items on the site and Federal and state laws govern the sale of firearms and other restricted items. Ownership policies and regulations are followed using licensed firearms dealers as transfer agents. Currently GunBroker.com has over 1.7 million registered users, with more than 400,000 auctions running at any time and over 3 million unique monthly visitors to the site. This rare configuration is available immediately in small quantities! 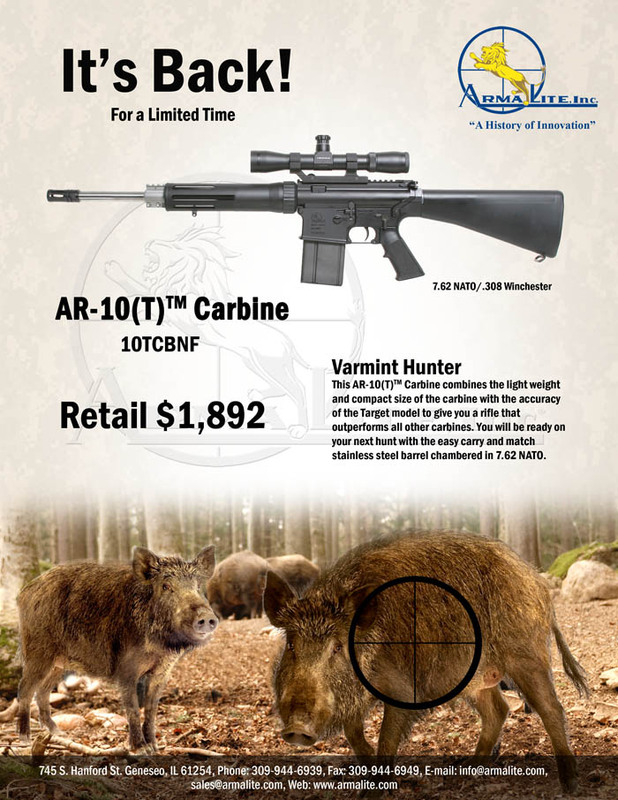 ArmaLite is pleased to announce the immediate availability of a limited run rifle. We have just finished a small batch of AR-10A4’s with TWO special upgrades. These rifles have the added value of a stainless steel match grade barrel and a National Match trigger. This is a rare configuration of an AR-10. 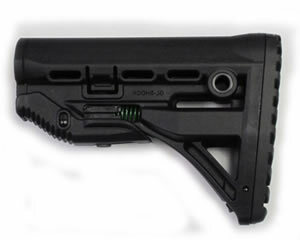 The rifles are being shipped as an EXCLUSIVE to the RSR Group, one of the top firearms distributors in the U.S. (RSRgroup.com) For interested customers, the formal name of this rifle is AR-10A4 BSNF. Contact your local ArmaLite dealer for details. Armalite.com. (Geneseo, IL) ArmaLite, Inc.® is pleased to announce its first-ever AR-10® A2 with forward assist is now available! The premiere rifles came off the line and were test-fired on November 30th. The first of the new A2’s with forward assist are rifles. They are also being built as carbines: Both the rifle and the carbine are available with black or green furniture. The introduction of the new AR-10A2’s with forward assist is just the first shot in ArmaLite’s December To Remember. Watch for more exciting news in the weeks to come! About: ArmaLite has one of the broadest product lines in the firearms industry. We manufacture and sell semiautomatic rifles in a variety of calibers including 5.56mm and 7.62mm, long range super-accurate bolt action rifles in calibers including .308 Winchester, 300 Winchester Magnum, 338 Lapua, and 50 BMG, and classic 9mm. 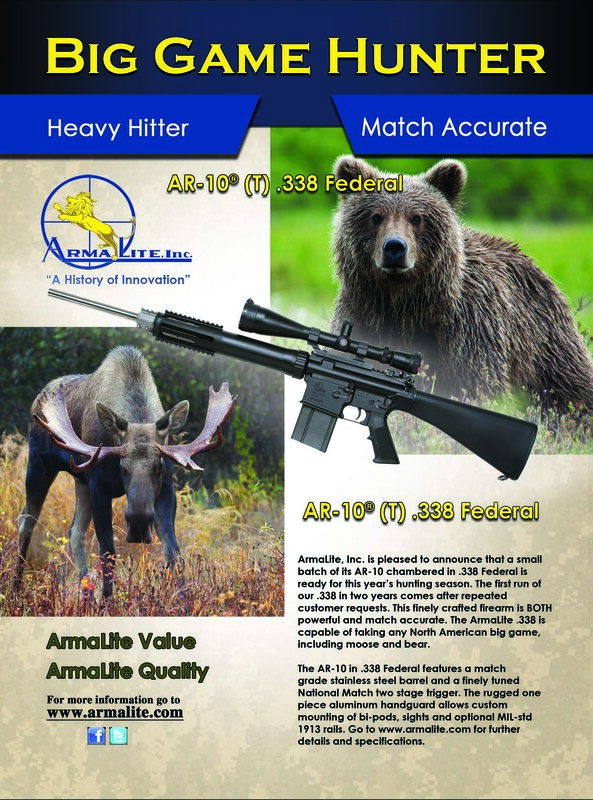 Visit www.armalite.com. Geneseo, IL – In February 2010, ArmaLite announced the return of its popular Hog Gun, the AR-10(T) Carbine. Within 10 days every one of them was gone. Now, nine months later, IT’S BACK, it’s in stock, and you can have one for this year’s hunting season. But if you want one, don’t wait. This finely crafted weapon has been produced once again in a small batch. Quantities are limited and will not last long. “This AR-10(T) Carbine combines the light weight and compact size of the carbine with the accuracy of the Target Model to give you a rifle that outperforms all other carbines. You will be ready on your next hunt with the easy carry and weather resistant stainless steel barrel chambered in 7.62 NATO.” says Tacticle-Life.com. Included with Rifle: One 10 Round Magazine, One 20 Round Magazine, Black Case, Limited Lifetime Warranty. ArmaLite has one of the broadest product lines in the firearms industry. We manufacture and sell semiautomatic rifles in a variety of calibers including 5.56mm and 7.62mm, long range super-accurate bolt action rifles in calibers including .308 Winchester, 300 Winchester Magnum, 338 Lapua, and 50 BMG, and classic 9mm pistols. 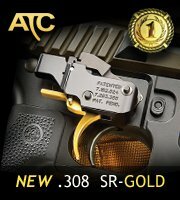 Visit: www.armalite.com. For some time if I saw some shooting related product that was new, unusual or a good buy on ebay I would post thinks on my websites. This was beneficial for visitors, sellers and myself as ebay would pay a few pennies a click. Not a big deal and everyone wins. Well last week something changed and I was no longer allowed to log in to my ebay partner account. This prompted me to contact support. Several hours later I received the following reply. During a recent review, we’ve found that you have violated the ePN Code of Conduct by placing links on websites with unacceptable material. Your account has been terminated and 100% of your pending commissions will be reversed. You are not eligible to rejoin eBay Partner Network. As stated in the ePN Code of Conduct section (d)(2), these practices are prohibited. I find it beyond comprehension that on one hand ebay will allow the sales of firearms related products while on the other hand not allow a firearm related site to have partner links. A complete hypocritical position on the part of ebay. Going forward I am on a personal mission to inform visitors of my sites about Ebay’s anti gun policy. I encourage you the visitor to seek alternative pro gun or at the least gun neutral sources for your all of your purchases. Don’t support those who don’t support us. 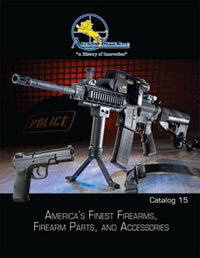 (Geneseo, IL) ArmaLite, Inc.® is pleased to announce that its new 2011 catalog is now available on line here. The new catalog features the latest in ArmaLite’s fine quality firearms and accessories including many new third party items from top level manufacturers like MAGPUL and TRIJICON. You may also order a hard copy of the ArmaLite catalog by calling 800-336-0184 or by visiting Armalite and following the instructions.